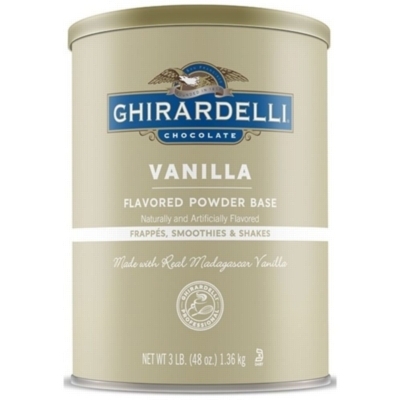 Inspired by slow-churned, premium vanilla ice cream, Ghirardelli's versatile and refined Vanilla Flavored Power Base is made with real Madagascar Bourbon vanilla and flecks of real vanilla bean seeds for a truly luxurious drink experience. Maintains smooth and even consistency for duration of frappé enjoyment. Great for creating hand-crafted frappés, fresh fruit smoothies, specialty frozen cocktails and kid friendly milkshakes. 0g trans-fats per serving and is formulated to dissolve in both water and milk. An amazing foundation to create infinitely indulgent beverages. One can makes approximately 31 drinks. One case = 6 cans. Combine liquid with all other ingredients in a blender and blend until smooth. Top with whipped cream. This product has a Video Description. INGREDIENTS: Sugar, creamer (coconut oil, corn syrup solids, sodium caseinate - a milk derivative, sugar, mono and diglycerides, dipotassium phosphate, soy lecithin - an emulsifier, silicon dioxide, tetrasodium pyrophosphate, polysorbate 60), nonfat dry milk, natural & artificial flavor, salt, vanilla powder, vanilla bean seeds, silicon dioxide, guar gum, xanthan gum.